In a head to head multi-sport charity event filming for Reel West Coast TV, 2009 Super Bowl Champion Mitch Berger (black shirt) took on former NHL star and Olympic silver medalist Brian Savage (blue shirt, showing off Mitch’s ring) in a shootout at the magnificent Quivira Golf Course; designed by Jack Nicklaus himself. 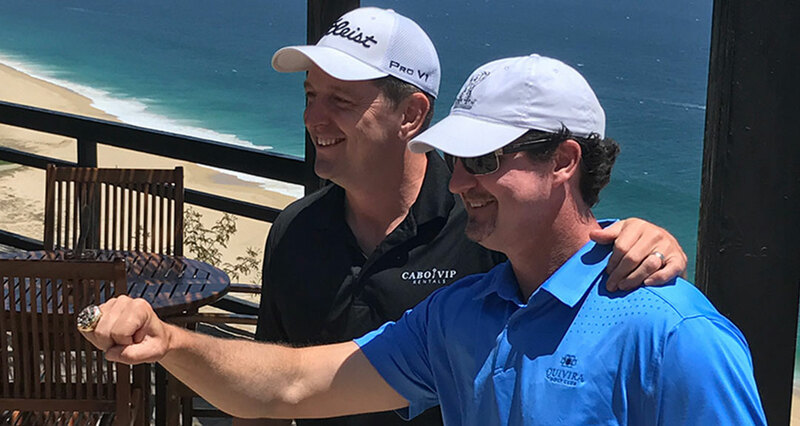 Berger was able to edge Savage on the final hole to win by 1 in a tight golf match, which is the first of many celebrity head-to-head competitions. 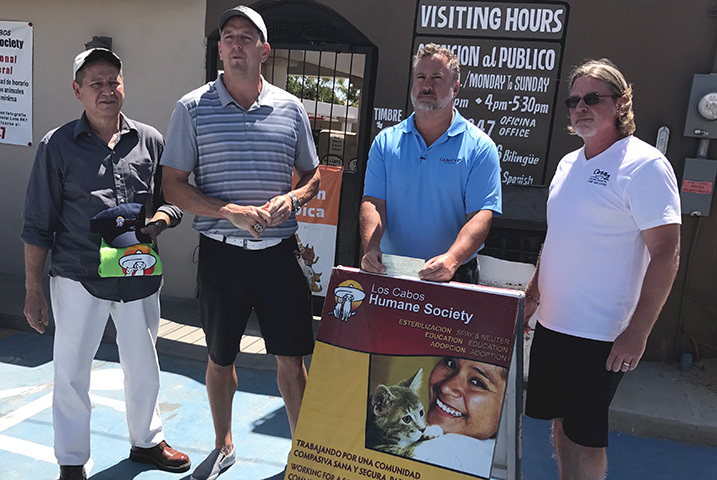 Pictured above, in support of the Los Cabos Humane Society on behalf of the charity event, a donation was made by Pete Pancel (second from right) of Cabo VIP Rentals to Marc Poelvoorde (far left), Director of the Los Cabos Humane Society. The Los Cabos Humane Society is committed to a safe, compassionate and prosperous Los Cabos. Last year they were able to spay/neuter over 4000 animals in the community and help educate the students of Los Cabos on the importance of responsible animal care. Joining in on the presentation is Super Bowl Champ Mitch Berger (second from left) and Cabo Caz (far right) of Caswell Team Realty.